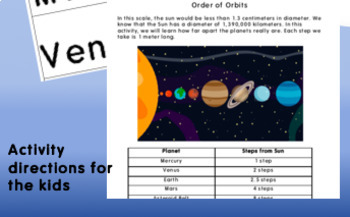 This product contains multiple resources to teach an engaging/kinesthetic lesson to model how far away the planets are from the Sun. 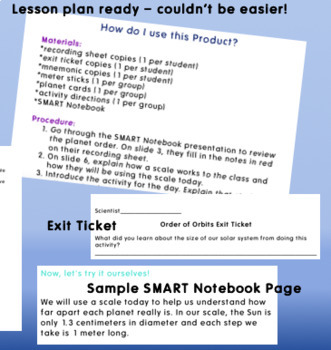 The lesson starts with a SMART Notebook to teach some important background information and then goes right into a group activity where students represent each planet's distance from the Sun using a scale, a planet card, and their own steps. 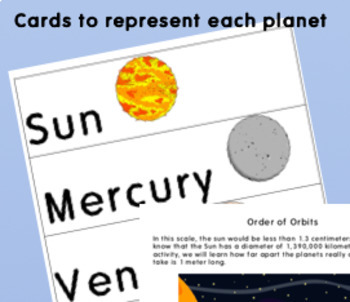 My students absolutely loved this activity, but most importantly really grasped how big our Solar System truly is! What is the best part of this lesson? EVERYTHING is done for you. You can buy it today and teach it tomorrow! The only supply you need that is not included is a meter stick!